Indigenous peoples have the right to the full enjoyment, as a collec-tive or as individuals, of all human rights and fundamental freedoms as recognized in the Charter of the United Nations, the Universal Declaration of Human Rights4 and international human rights law. Indigenous peoples, in exercising their right to self-determination, have the right to autonomy or self-government in matters relating to their internal and local affairs, as well as ways and means for financ-ing their autonomous functions. 1. Indigenous individuals have the rights to life, physical and men-tal integrity, liberty and security of person. Indigenous peoples and individuals have the right to belong to an indigenous community or nation, in accordance with the traditions and customs of the community or nation concerned. No discrimina-tion of any kind may arise from the exercise of such a right. 2. States shall provide redress through effective mechanisms, which may include restitution, developed in conjunction with indigenous peoples, with respect to their cultural, intellectual, religious and spir-itual property taken without their free, prior and informed consent or in violation of their laws, traditions and customs. 1. Indigenous peoples have the right to manifest, practise, develop and teach their spiritual and religious traditions, customs and cer-emonies; the right to maintain, protect, and have access in privacy to their religious and cultural sites; the right to the use and control of their ceremonial objects; and the right to the repatriation of their human remains. 2. States shall seek to enable the access and/or repatriation of cer-emonial objects and human remains in their possession through fair, transparent and effective mechanisms developed in conjunction with indigenous peoples concerned. 1. Indigenous peoples have the right to revitalize, use, develop and transmit to future generations their histories, languages, oral tradi-tions, philosophies, writing systems and literatures, and to designate and retain their own names for communities, places and persons. 2. Indigenous individuals, particularly children, have the right to all levels and forms of education of the State without discrimina-tion. 3. States shall, in conjunction with indigenous peoples, take effec-tive measures, in order for indigenous individuals, particularly chil-dren, including those living outside their communities, to have access, when possible, to an education in their own culture and pro-vided in their own language. 2. States shall take effective measures, in consultation and coopera-tion with the indigenous peoples concerned, to combat prejudice and eliminate discrimination and to promote tolerance, understand-ing and good relations among indigenous peoples and all other seg-ments of society. 2. States shall take effective measures to ensure that State-owned media duly reflect indigenous cultural diversity. States, without prejudice to ensuring full freedom of expression, should encour-age privately owned media to adequately reflect indigenous cultural diversity. States shall consult and cooperate in good faith with the indigenous peoples concerned through their own representative institutions in order to obtain their free, prior and informed consent before adopt-ing and implementing legislative or administrative measures that may affect them. 1. Indigenous peoples have the right to maintain and develop their political, economic and social systems or institutions, to be secure in the enjoyment of their own means of subsistence and develop-ment, and to engage freely in all their traditional and other eco-nomic activities. 2. States shall take effective measures and, where appropriate, spe-cial measures to ensure continuing improvement of their economic and social conditions. Particular attention shall be paid to the rights and special needs of indigenous elders, women, youth, children and persons with disabilities. 1. Particular attention shall be paid to the rights and special needs of indigenous elders, women, youth, children and persons with dis-abilities in the implementation of this Declaration. Indigenous peoples have the right to determine and develop pri-orities and strategies for exercising their right to development. In particular, indigenous peoples have the right to be actively involved in developing and determining health, housing and other economic and social programmes affecting them and, as far as possible, to administer such programmes through their own institutions. 1. Indigenous peoples have the right to their traditional medicines and to maintain their health practices, including the conservation of their vital medicinal plants, animals and minerals. Indigenous indi-viduals also have the right to access, without any discrimination, to all social and health services. 1. Indigenous peoples have the right to the lands, territories and resources which they have traditionally owned, occupied or other-wise used or acquired. 2. Indigenous peoples have the right to own, use, develop and control the lands, territories and resources that they possess by rea-son of traditional ownership or other traditional occupation or use, as well as those which they have otherwise acquired. 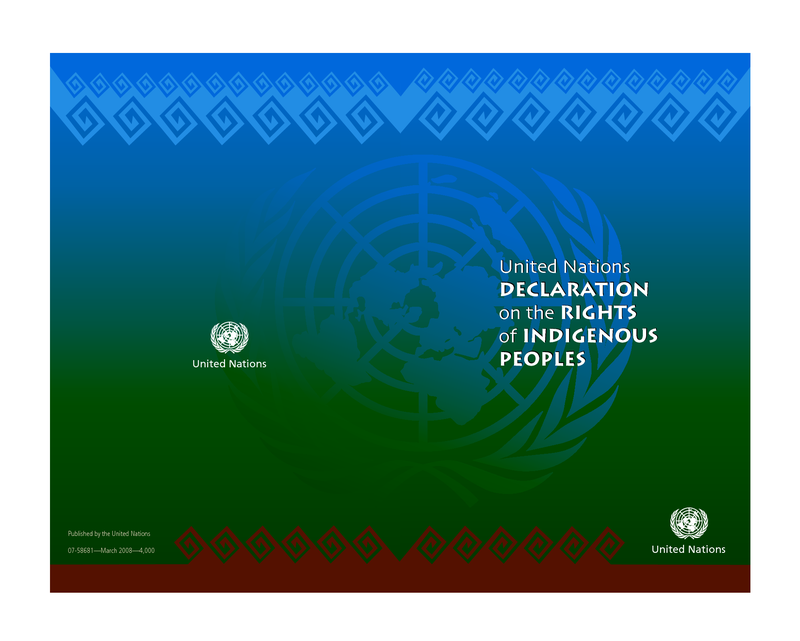 States shall establish and implement, in conjunction with indige-nous peoples concerned, a fair, independent, impartial, open and transparent process, giving due recognition to indigenous peoples’ laws, traditions, customs and land tenure systems, to recognize and adjudicate the rights of indigenous peoples pertaining to their lands, territories and resources, including those which were traditionally owned or otherwise occupied or used. Indigenous peoples shall have the right to participate in this process. 1. Indigenous peoples have the right to redress, by means that can include restitution or, when this is not possible, just, fair and equita-ble compensation, for the lands, territories and resources which they have traditionally owned or otherwise occupied or used, and which have been confiscated, taken, occupied, used or damaged without their free, prior and informed consent. 1. Indigenous peoples have the right to the conservation and pro-tection of the environment and the productive capacity of their lands or territories and resources. States shall establish and implement assistance programmes for indigenous peoples for such conservation and protection, without discrimination. 2. States shall take effective measures to ensure that no storage or disposal of hazardous materials shall take place in the lands or ter-ritories of indigenous peoples without their free, prior and informed consent. 2. States shall undertake effective consultations with the indig-enous peoples concerned, through appropriate procedures and in particular through their representative institutions, prior to using their lands or territories for military activities. 1. Indigenous peoples have the right to maintain, control, protect and develop their cultural heritage, traditional knowledge and tra-ditional cultural expressions, as well as the manifestations of their sciences, technologies and cultures, including human and genetic resources, seeds, medicines, knowledge of the properties of fauna and flora, oral traditions, literatures, designs, sports and traditional games and visual and performing arts. They also have the right to maintain, control, protect and develop their intellectual property over such cultural heritage, traditional knowledge, and traditional cultural expressions. 2. In conjunction with indigenous peoples, States shall take effec-tive measures to recognize and protect the exercise of these rights. 2. States shall consult and cooperate in good faith with the indig-enous peoples concerned through their own representative institu-tions in order to obtain their free and informed consent prior to the approval of any project affecting their lands or territories and other resources, particularly in connection with the development, utiliza-tion or exploitation of mineral, water or other resources. 3. States shall provide effective mechanisms for just and fair redress for any such activities, and appropriate measures shall be taken to mitigate adverse environmental, economic, social, cultural or spiri-tual impact. 1. Indigenous peoples have the right to determine their own iden-tity or membership in accordance with their customs and traditions. This does not impair the right of indigenous individuals to obtain citizenship of the States in which they live. Indigenous peoples have the right to promote, develop and main-tain their institutional structures and their distinctive customs, spiri-tuality, traditions, procedures, practices and, in the cases where they exist, juridical systems or customs, in accordance with international human rights standards. 2. States, in consultation and cooperation with indigenous peo-ples, shall take effective measures to facilitate the exercise and ensure the implementation of this right. 1. Indigenous peoples have the right to the recognition, observ-ance and enforcement of treaties, agreements and other constructive arrangements concluded with States or their successors and to have States honour and respect such treaties, agreements and other con-structive arrangements. Indigenous peoples have the right to have access to financial and technical assistance from States and through international coopera-tion, for the enjoyment of the rights contained in this Declaration. The organs and specialized agencies of the United Nations system and other intergovernmental organizations shall contribute to the full realization of the provisions of this Declaration through the mobiliza-tion, inter alia, of financial cooperation and technical assistance. Ways and means of ensuring participation of indigenous peoples on issues affecting them shall be established. The United Nations, its bodies, including the Permanent Forum on Indigenous Issues, and specialized agencies, including at the coun-try level, and States shall promote respect for and full application of the provisions of this Declaration and follow up the effectiveness of this Declaration. All the rights and freedoms recognized herein are equally guaran-teed to male and female indigenous individuals. and in accordance with international human rights obligations. Any such limitations shall be non-discriminatory and strictly necessary solely for the purpose of securing due recognition and respect for the rights and freedoms of others and for meeting the just and most compelling requirements of a democratic society.